The ultimate catch and release fishing program, this magnetic wooden puzzle game features aquatic animal artwork. 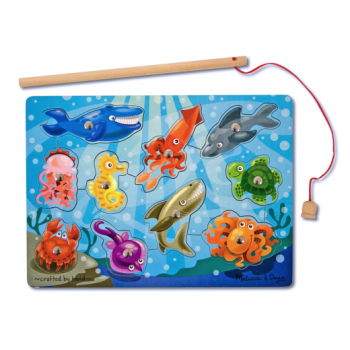 Use the magnetic fishing pole to �catch� the ten, colourful sea friends from the game board. Enjoy the challenge of returning them to the depths! A creative way to encourage eye-hand and fine motor development.